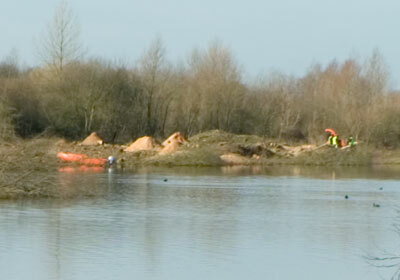 This is a picture of what is left of a once beautiful lake, Thrupp Lake at Radley. All of the islands have now been cleared virtually of all vegetation. The remains of the hundreds of trees that have been cut down are slowly being reduced to piles of chippings. However, whilst the ecology has taken a terrible knock, the lake is still there and nature is a great healer. If RWE npower can be stopped from continuing with their dastardly plans, the area will recover and will become as beautiful, or more beautiful, than it ever was. Please support the campaign to save it. With the passage of the 1st of March, it is now the “official nesting season.” RWE npower are now forbidden to cut down any more trees. However they must be fearful that ground nesting birds will continue to use the site, and have apparently been doing their best to deter them from doing so. Deliberate harassment of birds on the lake has allegedly been witnessed and has been reported to the police and RSPCA. Reports of a swan’s nest being destroyed have also been made. The fact that the swans were distressed by this and that they have made attempts to reestablish it indicates that this was an active nest, not an old nest as npower have tried to say. Of course the birds themselves are oblivious of the official dates of the nesting season, and the unusually mild weather has meant that nesting will have started early this year. Kingfishers were observed displaying near to their nest a few weeks ago, an indication that this nest was also active. Nothing has been seen of the kingfishers since the work began – yet these are supposed to be a protected species! Crimes are being committed not only against the wildlife at the lakes, but also against the local people who have applied to have this lake and its surrounds protected as a Town Green, with a Public Enquiry due to be held in April. What is happening here is outrageous and an affront to everything we hold dear in the 21st century. All those responsible, and complicit, should be thoroughly ashamed. No red noses at the Radley Lakes! … only red faces and bloodstained hands. 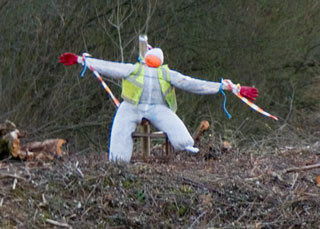 This is Kelly the Scarecrow amidst the devastation illegally wreaked by RWE npower on swan’s island at Thrupp Lake. Kelly the Scarecrow’s job was to frighten off the swans who want to (re)build their nest at this spot, the spot where they have nested every year for many many years. RWE npower were a sponsor of Red Nose Day. Well, the swans were not terribly impressed by Kelly and have now moved onto the adjacent isthmus, which is why npower have put up signs and barriers to keep people and their pets out of this area. Nesting swans can get very aggressive and can inflict quite serious injury with their powerful wings, so it is best to keep out of their way. Children particularly should not venture anywhere near them. This is not a satisfactory arrangement, either for users of the lakeside paths or for the swans. The swans will clearly need to be found better premises in future years, something that npower’s all-knowing ecologists should have thought of before they destroyed the swans’ original nest site. Kelly the Scarecrow has meanwhile moved on to other more pressing duties in npower’s ailing and beleaguered public relations department.